Today I have the great pleasure of showing some animal masks by Ruben Hernández. Some belong to Mahina Drees Burns and others are from my collection. I will start with three goats. The first, which is obviously worn, had been in the collection of my friend Tom Kolaz and I bought it from him in 2014. It was made in the 1980s. 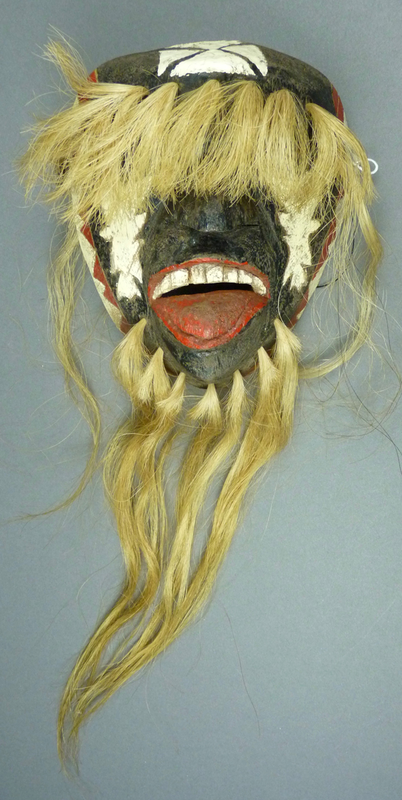 This mask has obvious wear on the face, demonstrating that rough treatment can occur in the revelry of a fiesta. Ruben Hernández is a Yaqui carver who lives and works in Vicam, Sonora. I have been familiar with this carver’s work for many years. For some reason that is unknown to me, one finds masks in Ruben’s style under at least three different names—Ruben Hernández, Martin Ramírez Urbanezo, and Antonio Rosas. I suppose it is possible that these are three separate carvers who share one overlapping style, but I tend to think that Ruben carved under all three names. I have masks of Ruben in my collection that were collected in Sonora by dealers other than Barney and Mahina Drees Burns. When I photographed the Burns mask collection, I found at least four additional masks by Ruben, some attributed to him and some to other carvers. I also encountered a number of masks by other carvers that had been erroneously attributed to Ruben Hernández by those who sold them to Barney and Mahina. This has been, of course, a generic problem with Pascola masks collected in Sonora, reflecting genuine similarities in style between carvers, along with a tendency for one artist to repaint another carver’s work. Generic local styles add to the confusion. Today I will focus on human faced masks from these collections that are typical of Ruben’s hand. Next week I will discuss Ruben’s animal faced masks. Here is a mask from my collection that I purchased on EBay™ in 2005. 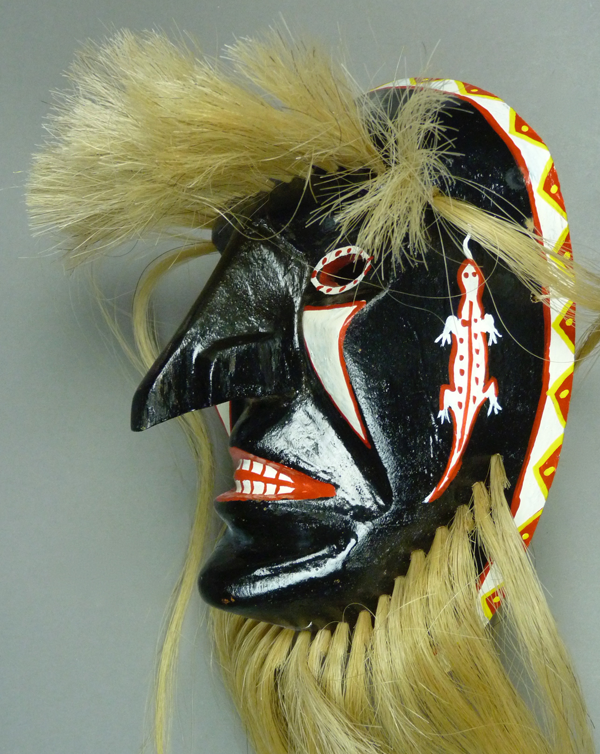 I recall that a dealer offered a series of masks by this carver, and I only purchased the best of them. I tell you this to emphasize that Ruben has carved many masks and the quality of those masks has varied from mediocre to wonderful. This one was labeled as the work of Martin Ramírez Urbanezo and appears to be undanced. I was immediately impressed with the dramatic nature of this carving. Looking at the details in comparison to those on masks by Hilario Álvarez Mendoza, I am struck by the similarities in their styles, although Ruben carves with greater flair. Soterito Matus is another Yoeme carver whom I discovered during my photographic documentation of the Barney and Mahina Burns mask collection. Although his name appears on a number of masks, none of the labels indicate where he lives. I am guessing that he lives in Potam, Sonora. I have just one human faced mask to show you, along with a goat, four dogs, and two birds. 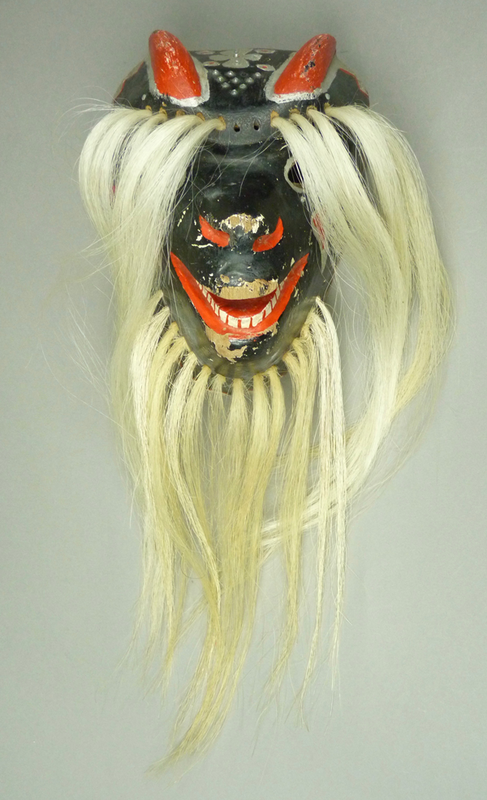 This human faced mask was collected by Barney Burns and Mahina Drees Burns after 7 years of use by the carver. In March 2016 I traveled from Pennsylvania to Tucson Arizona for ten days to photograph masks that had been collected in Northern Mexico by Barney Burns and Mahina Drees Burns. One of my purposes was to learn about carvers who were previously unknown to me. So I was pleased to encounter the masks of Cirilio Ramírez Amarillas of Potam, Sonora. Today I will share some of what I learned about this artist. You will notice that he carves most of his masks following one particular design and that these masks demonstrate a distinctive style. 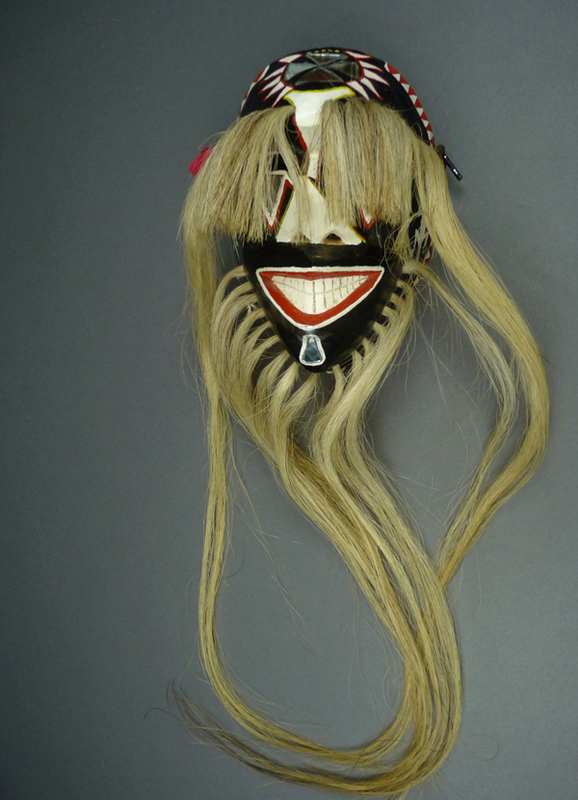 The first of these masks was collected by Barney and Mahina in 2007, after it had been danced for three years. It is a handsome mask. Inlaid triangular mirrors are used for the forehead cross, the triangles under the eyes, and on the chin.